This model is a 3/4 (three quarter) size, so should be suitable for teenaged children, approximately age 12 - 15, or smaller adults. 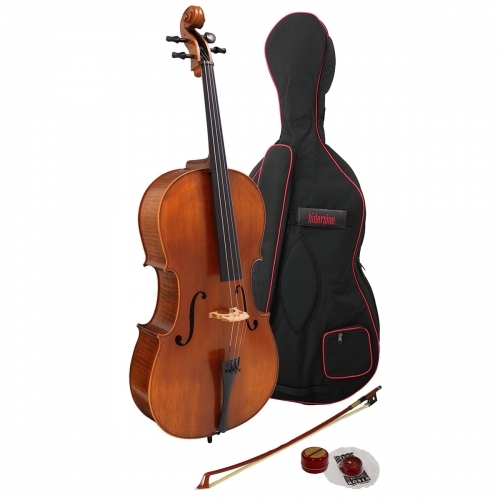 The Hidersine Vivente cello is available in 4/4, ¾, ½, ¼ and 1/8 size variants. We recommend that you speak to your teacher or local store to ensure you choose the appropriate size for you or your child. Hidersine Vivente cellos feature a Wittner ‘Ultra’ Tailpiece and a Carbon Fibre Endpin. Both these innovative additions help reduce the cello’s overall weight, therefore making it easier to handle and transport. Plus, many people believe that a carbon fibre endpin allows the instrument to resonate more fully and therefore sound better. A tone that will continually improve. Vivente violins, violas, cellos and double basses all benefit from a genuine Ebony fingerboard. This prized hardwood has traditionally been used for fingerboards for hundreds of years due to its truly long-lasting properties. Unlike stained or ‘ebonized’ softwoods often used on student instruments, genuine Ebony will not mark, pit or wear out under lengthy playing periods. Rather it will remain structurally sound for a very long time, and will also feel smooth on the fingers, helping make the playing experience more pleasant all round. Padded gigbag/carry case with bow holder and accessory pockets. Solid Spruce Table, Solid Maple back and ribs with graphic flame, Carved Maple Neck, Genuine Ebony fingerboard and pegs, Seasoned Maple Bridge, Wittner Ultra lightweight tailpiece with integral adjusters, Carbon Fibre endpin, Steel Strings.